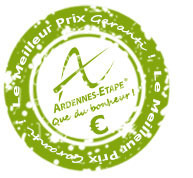 Best price guarantee is one of Ardennes-Etape's many advantages. Ardennes-Etape guarantees you holiday homes for the lowest price all year long and a complete service. Should you however find the same holiday home on another website for a lower price, we will reimburse you the difference if you book the same stay via Ardennes-Etape. You may in such a case take contact with our Contact Center via info@ardennes-etape.com or +32 80 29 24 00 from Belgium or +31 40 304 10 87 from the Netherlands. The best price guarantee applies to Ardennes-Etape's holiday homes with a rental price and fixed, obligatory charges. The deposit, the booking fee of €25, the cancellation insurance and the rental damage insurance are not to be included. If an Ardennes-Etape holiday home has variable consumption costs, the best price guarantee then only applies to the rental price (consumption costs, deposit, booking fee of €25, cancellation insurance and rental damage insurance are not to be included). You give us the link of the other website, including information about the chosen stay, the price and the link for this holiday home on our website. The cheaper offer can be booked online and is still available when we check it. The same arrival- en departure date. You may use on the other website a reduction code that is not available for Ardennes-Etape. The other website offers you via mail or telephone a reduction that is not displayed on the website.